To say the words “Irish Crafts”, what would inherently come to mind? Possibly Hand knit Aran sweaters, Blackthorn walking sticks, or maybe a willow basket or patchwork quilt? Nowadays, the crafts of Ireland are so much more. For the discerning visitor to Inishowen, it is more fun to venture out and follow the trail around the peninsula. The craftsmen and women of Irish crafts began as far back as the Stone Age (some 5000 years ago) when designs of metalwork, baskets, and textile weaving, pottery and glass were created out of sheer necessity. All over the county there are men and women drawing on centuries of inherent skills and expertise handed down from their forefathers. Inishowen proudly hosts a wide variety of art and craft sites around the peninsula. “At home” these artists welcome visitors to peruse their creative works, ask questions and leisurely choose their own souvenirs or thoughtfully select gifts for friends and family. Artistry includes painting and photography, bogwood sculpture and woodcrafts, pottery, knitwear and fabric designs, accessories and jewellery. The visitor will be truly appreciative of the wide range and quality on offer, incorporating ancient and innovative design. 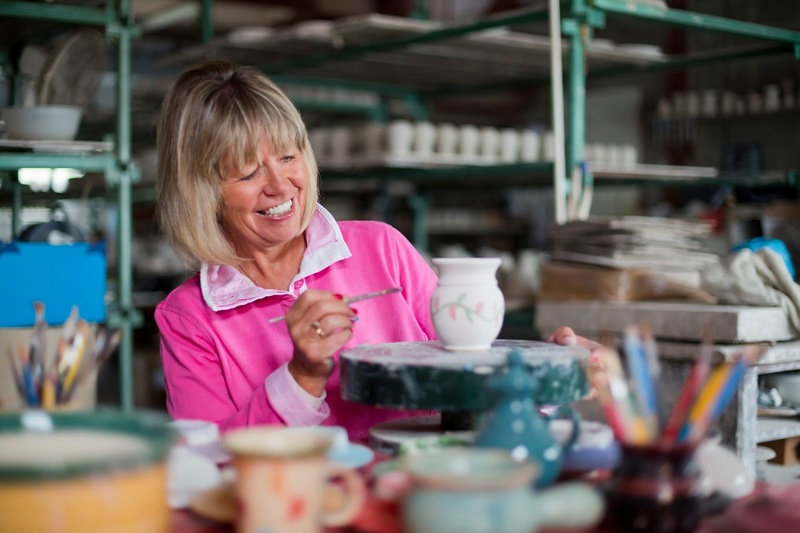 There are places such as Moville pottery where you’ll be welcomed to watch a potter at his wheel. Pause a while and appreciate the painting of this fascinating form of art; purchase a piece to treasure if one takes your eye. Travelling north enroute to Culdaff, you’ll come upon a bogwood gallery that harnesses nature’s earthy hidden gem. Six thousand years in the making, taking a piece of this artwork with you, means leaving with an ancient piece of Inishowen preserved in time. Travelling onward in a beautiful setting overlooking the mountainside at Trawbreaga Bay, you will find this landscape transferred into vibrant paintings and prints by local artists. Going on, to Ireland’s most northerly point, Malin Head, the mystical works of faeries and fauna will delight the imaginative mind at Carnmalin. At Banbas Crown, take in the view and variety of gifts celebrating an array of local art and crafts; rest a while before taking the next step of the trail. Following the Malin road to Carndonagh, find the local artist who works primarily with oils inspired by the beauty of her native Inishowen. Travelling west will bring you to another showcase of beautiful limited edition watercolour prints in the area of Ballyliffin. At Clonmany there is the opportunity to attend photography training, workshops and tours. Here, view the spectacular prints of the Northern Lights. Turning southward, 4km from Clonmany, a crafts shop and studio displays hand crafted Donegal tweed garments and accessories. On special days viewing maybe accompanied by traditional music as locals join in the creative atmosphere. Arriving in Buncrana, the location of your local tourist office, a variety of art and crafts are displayed. Next door, take in a cup of tea while the expert craftsman attends to all your photography needs to complete that perfect gift or souvenir. Inishowen Tourism provides a comprehensive leaflet with a map of the Arts & Crafts Trail. Start the journey of discovery on one of Ireland’s most scenic regions. Donegal Designer Makers are a network of over 30 craft members including members here in Inishowen, see the events guide at www.visitinishowen.com and join “the talented crafty creative crew”.